Alfredo Binda Trophy World Cup: what numbers…! – 90 minutes of TV coverage on RAI Sport2 (+ three repetitions). 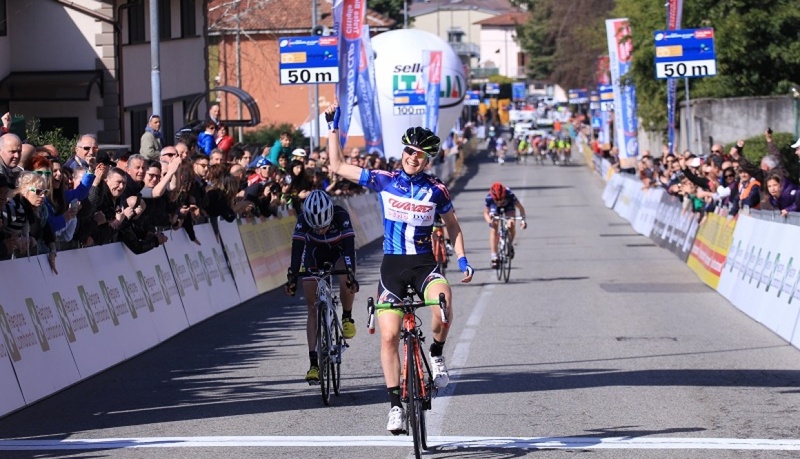 Sofia Bertizzolo (Team Wilier Breganze) won the 3rd Da Moreno Trophy today in Cittiglio (Varese). This was the first International edition of the race which all its fans know as the Mini-World Cup. 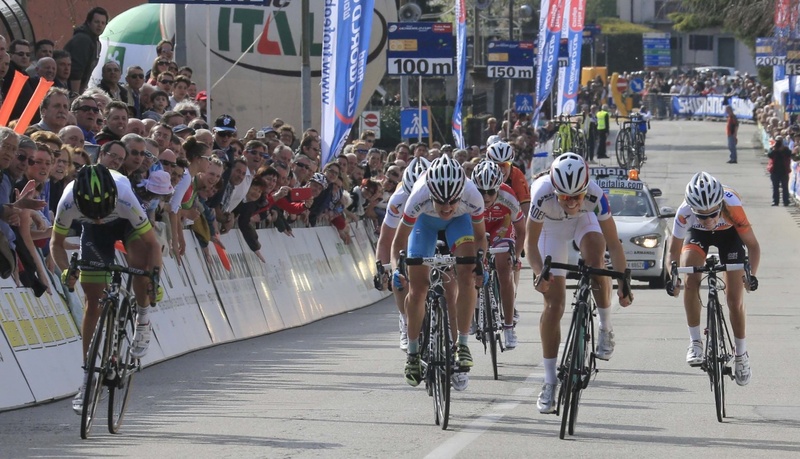 Bertizzolo beat French rider, Juliette Labous in the final sprint. In third place, just 3 seconds behind was Sofia Beggin (Team Wieler Breganze), who came in just before another French cyclist, Maelle Grossetete. The biggest group crossed the finish line 14 seconds later: “I’m delighted – said Bertizzolo after crossing the line – my team and I worked on the climb and then I tried to break away towards the end. They caught up with me though, so I tried again in the final sprint and it worked”. Sofia Bertizzolo will turn 18 on 21 August next. She is reigning European and Italian champion, Italian track champion, second in the world road championships and second in the Italian time trials. 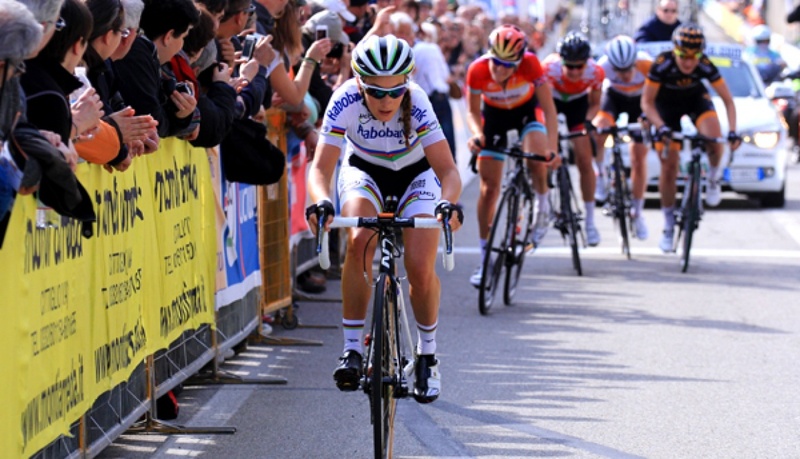 Tomorrow, Sunday 29 March, 138 athletes will take part in the 17th Alfredo Binda Trophy – second trial in the Women’s Cycling World Cup. They represent 24 teams, including national teams from France, Poland, Russia, Switzerland and USA. Number one will be worn by French rider Pauline Ferrand Prevot, World Road and Cyclo-cross champion. At the 3rd Da Moreno Trophy, ‘mini-World Cup’, an international junior race, 112 athletes from 19 teams will participate, including national teams from France, Lithuania and Switzerland. Both races will start from Laveno Mombello (Varese) and finish in Cittiglio (Varese). Elite cyclists will pedal for 55 km, followed by four circuits of 17 km, for a total of 123 km, while the junior race will cover almost 70 km. 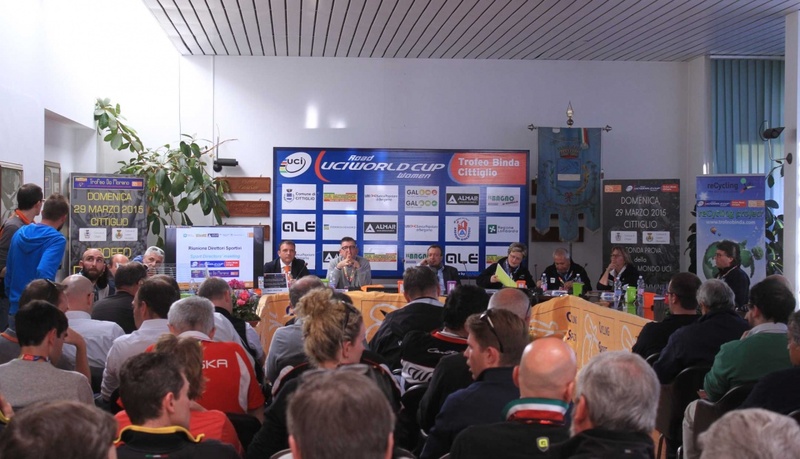 All of the best teams in the world will be present at the race which promises to be an extraordinary international sporting challenge: “We are delighted with the setting that we have prepared – explained Mario Minervino, president of Cycling Sport Promotion – I would like to thank everybody who has helped in organising this amazing event. Tomorrow, about 500 people, between volunteers and police, will ensure that the race runs smoothly and safely. And I’m grateful to everyone who has supported CSP’s work over the last 17 years, starting from the Mayor of Cittiglio, Fabrizio Anzani and the traffic police. Through them, I would like to thank all the Institutions and the fans and enthusiasts who will celebrate the 250 athletes, both elite and junior, participating tomorrow”. There is a festival feeling in Cittiglio, according to the Mayor, Fabrizio Anzani: “I join Mario Minervino in complimenting the whole territory – said Anzani – Cycling Sport Promotion has done fantastic work and today we are very happy to see the town hall full of team representatives who have come to Cittiglio from the four corners of the world”. 10:00 Laveno Mombello Philharmonic Band. Folk group “Sem Chi In scì” from Laveno Mombello. ore 11,30 flag display. Italian Army – Salute to the Authorities. The Festival of the “Binda Trophy” begins today. Welcome to Cittiglio! From today until Sunday, the whole Varese province will experience the excitement of the Women’s World Cup. The Alfredo Binda Trophy, which recalls one of the most extraordinary protagonists of heroic cycling, never fails to enthuse children, men and women of all ages who are happy to celebrate the cyclists who come from all over the world. Everyone in their own way expresses their joy and pride in their territory which hosts one of the most important events in the world cycling calendar. This event reaches beyond the world of sport and touches the hearts of thousands of people who collaborate, help and assist in the success of an event which lasts the whole year, thanks to the dedication of Mario Minervino and his co-workers in Cycling Sport Promotion. Local administrations, associations, groups, volunteers, athletes, police; everybody here chips in to make the Binda Trophy unforgettable. They work without a break, night and day, to make sure everything is working perfectly; constructing the stage, the flagpole and the podium. Barriers are put in place, the amplification is fine-tuned and pylons are built for the RAI cameras. In Laveno Mombello they even tried to cover Lake Maggiore, building a platform for the procession of the athletes on their way to sign the starting sheet. Strange the cycling world; you have to sign regardless of what will happen. In everyday life, the opposite happens but cycling, as we know, is fascinating because it goes against the flow. Some of the foreign teams have been testing these roads for days now. The latecomers will arrive today; 250 girls, both junior and elite, from all the continents. A great festival of colour and languages, dialects and ambitions, sounds and emotions. Some of the cyclists are worried about staying with the group. Some study tactics, testing themselves on the Orino climb and marking the exact point at which to break away from the group. Some ask their team members to work at staying together so that, this time, the race will be decided in the final sprint. Dreams, plans and thoughts, mixed with the sounds of the global village which is growing between Laveno and Cittiglio. Along the route, banners and flags appear, hedges are trimmed and the roads are scrubbed. In just a few hours the protagonists of the Binda and Da Moreno Trophies will pass by here and everything must be ready. Everything will be perfect, as always. Local children made a sign which has been set up at the roundabout in Cittiglio. 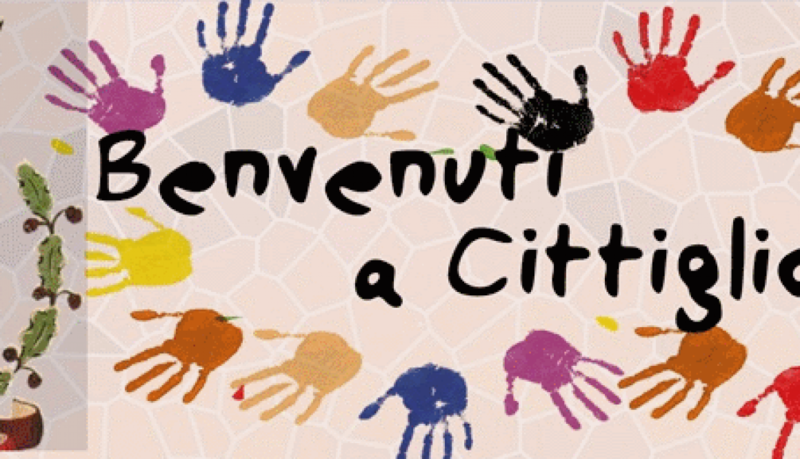 Their message is simple but effective: Welcome to Cittiglio. Fifty of them will parade and present a series of slogans which they coined for the occasion. The World Cup is a big party and the kids get involved with the kind of enthusiasm which makes them stand out, both on their bikes and at their school desks. A big party, this year in the sunshine! Don’t miss it! ore 11:30 flag display. Italian Army – Salute to the Authorities. ore 14:00 “Amici della Musica” band from Cittiglio. “Garibaldina di Treviolo” fanfare. Exibition by folkloristic group “i Tencit di Cunardo”. 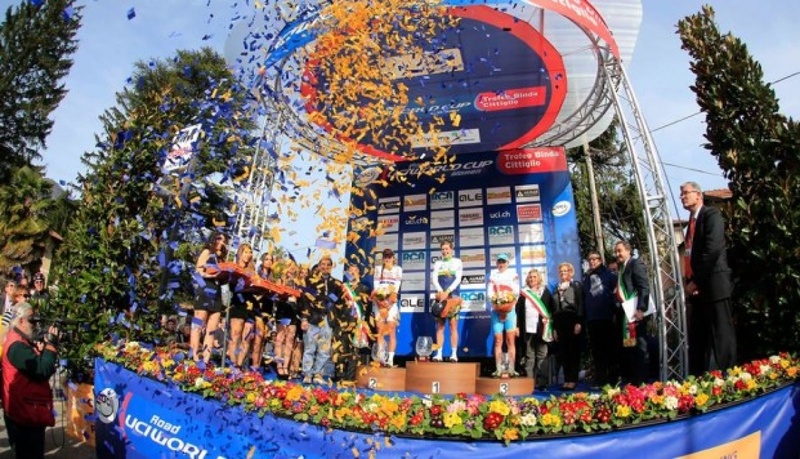 On Sunday, 29 March next the 17th Alfredo Binda Trophy – second trial of the Women’s Cycling World Cup and the 3rd Da Moreno Trophy, mini-World Cup will take place. Both races will start from Laveno Mombello (Varese) and finish in Cittiglio (Varese). The elite athletes will cycle along a 55 km route and will then do the final circuit of 17 km four times for a total of 123 km, while the junior race will follow a route of almost 70 km. The best teams in the world will be present in this pre-Olympic year for an extraordinary international challenge which will involve not only elite but also junior athletes in a competition which has no equal apart from the Olympics, World and Continental Championships. The long weekend in Laveno Mombello and Cittiglio will begin on Friday with the town-twinning between Cittiglio and Camerota. The festival will continue on Saturday and Sunday in the Park beside the train station. 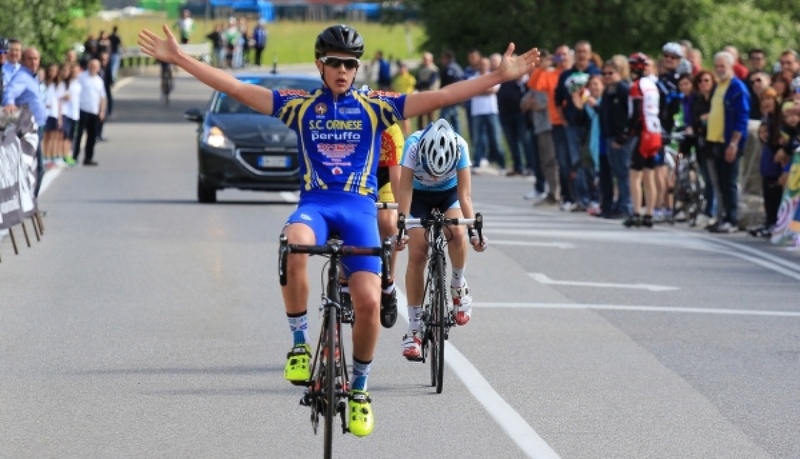 On Saturday there is a race for primary school students in Cittiglio. Sunday the third international Da Moreno Trophy for juniors will start at 9.15, while the Alfredo Binda Trophy will begin at 13.30. Meantime, while waiting for the outcome of the two much anticipated races, there will be lots of entertainment with music, folk groups, flag-throwers, colours and enthusiasm. ore 14,00 “Amici della Musica” band from Cittiglio. “Garibaldina di Treviolo” fanfare. Exibition by folkloristic group “i Tencit di Cunardo”. 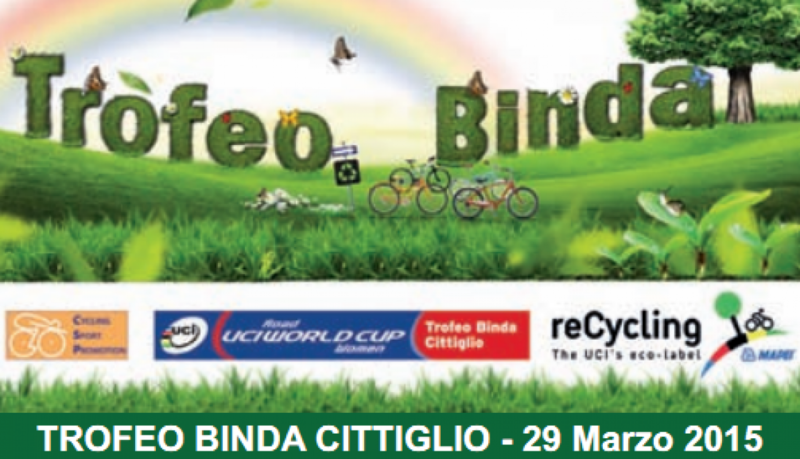 After last year great success, the Cycling Sport Promotion, the organiser of the “Alfredo Binda Trophy”, has renewed its commitment to the eco-friendly cause of the UCI Recycling program for the fourth consecutive year. The following institutions Commissione Europea, Provincia di Varese, Comune di Cittiglio, Comunità Montata Valli del Verbano, GAL dei Laghi e della Montagna, GAL delle Valli del Luinese, Comune di Camerota e Parco Nazionale del Cilento will play an active role within the “ReCycling” project, together with EXPO Foto (548)2015, the Milan world exhibition that will focus on nutrition and promotion of local products. In order to enhance our commitment to the environmental cause, this year we will support the proposals of Comune di Cittiglio for the preservation and protection of nature. Alongside the Cycling Sport Promotion initiatives of the last three years, the arrival area of the World Cup will be equipped with ecological ashtrays to encourage smokers not to throw cigarette butts on the ground. Great work has also been done promoting the new bike path, a new children’s playground and new tourist maps. To raise awareness about the cycle tracks around our territory, we have set up informative boards about the races at the start of the Laveno Mombello-Cittiglio cycle track which joins the two main towns of the Binda Trophy. As far as the environmental protection is concerned, during the race days, waste collection points will be set up in areas of greater public flow (start in Laveno Mombello arrival in Cittiglio, shopping village, team parking areas, secretary and press room) and inside the feeding area (Green Zone) for the athletes. This year the area will be looked after by AVIS volunteers (Italian Association of Blood Donors). Proper information on the use of the Green Zone will be passed on to the athletes through a specific flyer included in the race paper work and will be also available to the team managers during the technical meeting on Saturday afternoon in Cittiglio. As a proof of the total commitment of the organisers of the Italian women World Cup race, all technical guidelines are printed on special bleached without chlorine (FSA) paper with vegetable-based inks. Furthermore ENEL (national electricity supplier) was asked to provide “clean” energy at low environmental impact. To help the rural economy of our province this year two teams taking part in the Binda Trophy will be staying at the farm “”La Betulla” Brezzo di Bedero, where they will be able to enjoy fantastic views of Lake Maggiore. New this year, the Cycling Sport Promotion will use more than 500 meters of ecological TNT banners , made from recycled PET plastic bottles. Also, all the volunteers for the set up of panels and banners will be equipped with a bag labeled “recycling” to collect plastic cable ties used to fix the structures. The UCI Recycling Program has been widely addressed across the schools in the area, with the distribution of a specific leaflet and a special videoclip, featuring our mascot “Giambattista Eco-friendly Cyclist ” which was a great success with the children. The video is on our YouTube page. Some very interesting gadgets including promotional water bottles made of biodegradable material will be available to the children taking part in the “school project”, the inevitable pen holders “UCI ReCycling” bins and the new “UCI Recycling” Notepads made of recycled paper and cardboard, which will be given to the athletes, the VIPs and the authorities. During the competition days, the press room will be equipped with pens made of solid recycled cardboard and vegetable ink and recycled paper, the same paper as these documents are printed on. The logo “Think before you print” stands out on all our press releases, so the reader will only print documents if needed. Our safety plan has been endorsed once again by the Police of Varese, the Prefecture has ordered the closure of roads for the day of the race. The race route will be sign posted a week before the event to facilitate the athletes’ training. Alternative routes will also be prepared for regular traffic and two PPO will be set up to regulate incoming traffic in Laveno Mombello and Cittiglio. The problem of waste disposal is becoming more and more urgent, particularly as regards the disposal costs. Therefore the cooperation of everybody is needed to limit, if not to reduce, such costs that consequently affect the fees charged to each citizen. How and what to do? First of all, we need to cut down the production of waste, for example favoring purchases of products that minimize the use of packagings specially non-biodegradable ones and/or recyclable but this is not always easy to apply. The issue on which we all can take action immediately is the differentiation at the time of introducing the waste the into the appropriate sacs/containers: particularly plastics, glass, cans, paper, organic fractions but also drugs, dead batteries, used oils separating the cooking ones from the mineral ones, metals, garments, electronic and electrical products and bulky ones (pieces of furniture, domestic appliances, etc. ), as well as green waste and toxic waste (paints, solvents, detergents, etc. ). This is why to properly differentiate waste means to allow the appropriate centers to dispose of the waste with a consequent reduction of what inserted in the “violet sac” which, as well known, ends up in a landfill or is disposed of in incinerators. Furthermore it should be considered that some types of materials, such as plastics, glass and paper, are sold being recyclable; then we will not have a cost for disposal, but a revenue, which will represent an active voice in the economic balance of waste management. The minimum target to be achieved for the recycling and recovery of waste indicated by the Regional Law and the Provincial Plan is fixed in at least 65% of differentiation with a parallel reduction of waste of 3%. The Mountain Community Institution, who has been awarded the contract of service at community level, has printed and distributed to all citizens an explanatory pamphlet with very clear exhaustive information on the subject that we recommend to be very carefully consulted by everybody. It is obvious and intelligible that to properly differentiate the waste is also a concern for all of us. In conclusion each of us must always keep in mind the “4R that are good for the environment (and for our pocket, too )”: REDUCE, REUSE, RECOVER and RECYCLE. A new playground, called “Stì Park”, consisting of a small soccer field, table tennis, a cableway and outdoor gym tools was created at the bike-pedestrian track. Next year additional tools for a life trail and a springboard are foreseen. In exchange for the private use of a piece of municipal land in Via per Mombello, Agrilaghi Company placed along the bike-pedestrian track some stone benches and some small tables in the equipped area, as replacement of the payment of the fee for the use of the above mentioned municipal area, whereas other benches were donated by Monti Arreda Company whom we wish to sincerely thank. Lastly a part of the bike-pedestrian track was finally lit by means of energy saving tiles and use of solar energy. If the budget permits, for next year we are going to complete the entire length of the track, thanks to the campaign “Adopt a tile”. 4 Maps of the bike-pedestrian track were placed in some strategic points of the town (the railway station and accesses to the track) in order to identify the services related to the track itself. 5 Large ashtrays were placed on the ground and 5 small ashtrays on existing stakes and support devices in order to educate smokers not to throw cigarette stubs on the ground, thus respecting the environment in which we live. We have in mind to add some new games near the new playground, such as some fitness tools for the life trail and a springboard. Should there be any possibility to rent some nearby pieces of land, we might have more space available for a kiosk with music for our young people. The night fun to be reached by walking !!! The cost of a single solar tile with a dedication is of 99 Euro. Concerned citizens may subscribe to the adoption of a tile by a special card that will be distributed in schools or by applying to the municipal offices. The payment can be made by postal account. The so called “Water’s House”” will be installed in Piazzale De Peri, a site for the supply of drinking water, natural and sparkling, which will cost respectively € 0,05 / liter Foto casa acquaand € 0,10 / liter, while the cost of a rechargeable card will be of € 2,50. The City Council has decided to favor the consumption of public water installing the Water’s House that supplies natural or sparkling micro-filtered water. It is a public fountain that promotes the public aqueduct water exalting the features of quality and safety. The microfiltration system removes the excess of chlorine and other impurities that may be present in the water, improves the organoleptic characteristics, the smell, the natural flavor, the transparency and maintains the most balanced content of mineral salts. For safety purposes, a special ultraviolet lamp sterilizes the water before the supply. The filtered water is therefore tastier for drinking and suitable for cooking because it enhances and makes more defined the flavors of foods. Furthermore, as it was in the past, the House may become a point that favors aggregation and sociability, important values of tradition enhanced by a contemporary fountain that uses modern technologies for water. The Water’s House also takes a particular care of the environment as it uses all the available new resources to save energy and to reduce the production of plastics waste with consequent problems of disposal. The benefits of supporting a new policy of sustainable development are immediate. 65% of water is sold in plastic containers and each year approximately 320-350 thousand tons of PET containers end up in the trash. The consortium in charge of the recovery of plastics packagings recycles 124 thousand tons, representing 34%. The environmental impact of bottled water is even higher if we consider that 82% of the same moves throughout Italy along the highways.